Discussion in 'Coop & Run - Design, Construction, & Maintenance' started by NermalB, Jan 2, 2011. I'm also in the process of getting 8x12 shed myself. I was just at the movies and some how vent ideas started to pop out in my mind. I was thinking of getting them 2 fan ones that has the option of exhause out and in. Do you have windows in your shed ? I keep a box fan running in the summer. We go through about two a season; they get full of dust and the motor burns out. We just screw them into a convenient board, up against a hardware cloth wall. In this climate, solid walls are too hot, and large areas are hardware cloth instead of solid. I have it blowing out and on the downwind side. As Dawn says, household fans will not generally last long in an outdoor high-dust environment like a coop. This can become a fire hazard, so if you use a household fan at all please at least check it REAL FREQUENTLY and do it in the knowledge that it's a bit of a risk. In general it is safer to have the fan blowing in than out because it reduces the amoutn of dust that gets into the fan to cause problems. However this will cause a more "specific" breeze (as opposed to gentle sucking in of air through all other openings, if the fan is blowing out), which may be a problem in some particular coops. I'm in North Texas, and after three tries I think I finally have a coop that I can use through our scorching summers. First of all, it's sited in our yard someplace that gets solid afternoon shade. It's insulated, with radiant roof sheathing. 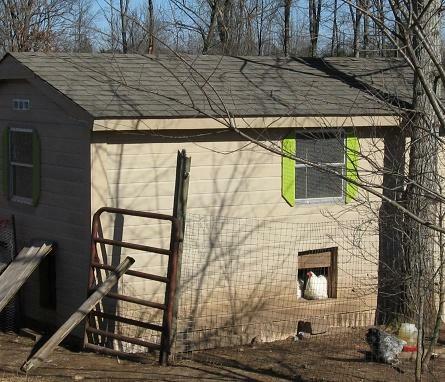 It's well ventilated, with a total of almost 32 square feet of ventilaton for an 8' by 8' coop, with 4 windows down at roost level and openings on all sides for cross ventilation. I had the coop built last August, and during an extended 100 plus heat wave, the inside of this coop stayed no hotter than the outside temperature in the shade. Victory! Honestly, I think the most significant factor was picking the right site. If you've got summer shade in your yard, think seriously about putting your coop there. The other thing that helps is to pick breeds of chickens that can handle the heat best. It best to have a few vents at high point of the coop. Also grow a few trees that provide shade for the coop. 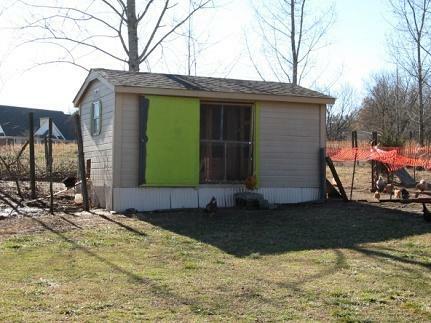 I have a 8x10 shed that the birds coop up in at night and though it has 3 windows, one on each wall and I have a hardware cloth "screen" door it is still extremely hot when they go to bed at 9 pm. It is under shade trees and the door faces north (really bad idea for the winter! Can't keep the solid door from blowing open while I work inside.) I also have large trees shading it from the afternoon sun. I have found that a fan in the east window blowing in helps some but the peaked roof area is still pretty hot and my birds that roost there in winter will not go up there in the summer. I want to put vents in the roof but after seeing some leaks around others in just their homes I decided to put vents on the east and west ends of the shed. There are small ones there already but I think I will remove those and put in much larger ones. I haven't found any at the local hardware stores that are large and acceptable for what I want so I think I will design and make them myself. That plus the fan blowing in should help that extreme heat at night in the summer. BTW, the Silkies are on the roost next to the blowing fan and seem to enjoy it. The Cochins are in the next coop and are in line with it and really like it. Come morning when it is cooler they just hop off the roost and get busy with the food hopper until I open the pop doors. In the past 2 summers I have used the same box fan I bought at Walmart for $14.